Today we are releasing a new free Add-on available to all clients with an active subscription. 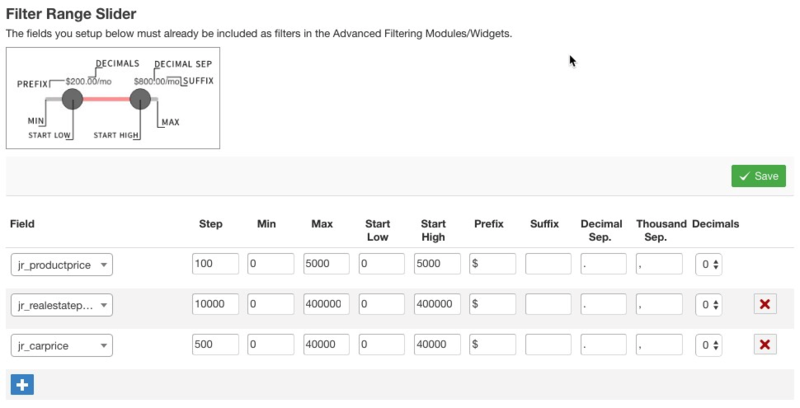 The Add-on works together with the Advanced Filtering Module/Widget to convert decimal and integer custom field filters into a visual slider with handles that can be dragged to set the search range. The Add-on lets you choose which fields to convert and has several settings per field so you can adjust the range limits, formatting and prefix and suffix to add before the number. In the image below, you can see what the Add-on admin dashboard looks like.